Inside Yoga – Explore the sensation, not the shape. Familiarize yourself with a sensory and very safe approach to yoga practice. Begin to notice what it is like to be inside the lanscape of the body. We don’t have a body; we are a body. I don’t expect students to perform perfect postures/shapes, I encourage them to notice what is happening in the body, to be interested in small changes ; to find out how to be comfortable in their own skin. .. …Do not kill the instinct of the body for the glory of the pose…. None of us were quite sure how the workshop on 19th January would go. As the yoga teacher involved, I aimed to prepare participants for lying down for 35 minutes and to introduce the notion of listening, sounds and silence. The sound therapist presented a sound bath which was well received and which seemed to help some participants to get to a state of deep relaxation quite quickly. One participant experienced “losing her body” and felt that the sound bath produced the “purest sounds”. Another saw imagery that was peaceful. This is probably attributed to being in a relaxed state between wakefulness and sleep – the “dozing off” time. The participant did report : “..I think I fell asleep..” Perhaps this person was experiencing a dominance of theta brainwaves?? There are five main frequency brain waves: Gamma (highest) Beta, Alpha, Theta, Delta (slowest recorded). The brain produces consistent waves at all frequencies. Everything we or say is regulated by the frequency of brain waves. Thus, throughout the day in your waking state, your EEG will display all 5 types of brain waves at the same time. However, one particular brain wave will be dominant depending on the state of consciousness that you are in. In normal activity, brain waves are of the beta type. However, during meditation, there is a shift in brain activity, with alpha waves the most commonly observed. This increase in alpha wave activity is associated with activation of the parasympathetic nervous system – the “rest and digest” system. Crucially, none of the workshop participants experienced a negative reaction to the soundbath. A couple of us were distracted by exterior construction noise but some said that they did not notice this or that they thought it was part of the soundbath. Another participant thought that some of the soundbath was a recording. I found this interesting since the British Academy of Sound Therapy website refers to a study that compared the effects of a 35 minute live soundbath with a recording of the same. The soundbath matched exactly the one presented in the workshop – Himalayan singing bowls, transitioning to Gongs, transitioning to crystal singing bowls, transitioning to therapeutic percussion. In the study the soundbath was live, where subjects lay on the floor and received around 35 minutes of sound (as in the workshop) and by a recording of the same which was available online. The study set out to answer the following questions. Is live sound more or less effective than digitally recorded and delivered sound? What are the conscious altering effects of this method and to what degree are the domains effected? What are the therapeutic effects of sound induced ASC? The data showed positive effects upon physical relaxation, imagery, positive mood, insightfulness, transcendence and ineffability (I struggle to understand these last 2) across both the live and recorded soundbath. The live performance seemed to produce a more energizing experience – perhaps due to the physical vibrations of the instruments – and the recording was felt to me more immersive – perhaps due to the blocking out of external noise. One participant had suggested that a recorded version might be more useful for that very reason. ….Zen fractal tones stimulate passive listening, reduce Tinnitus awareness, promote relaxation and interrupt the Tinnitus-stress cycle. Zen noise can provide additional relief from Tinnitus…. We are having another go in February. This will be a different presentation than last time. As always, comments are most welcome. I am indebted to my student for helping me to clear the mist but also for jolting my awareness back towards what I know about teaching but don’t always remember ; namely, that clarity depends upon keeping things simple, upon varied repetition and always checking that the message is clear enough. Mabel Todd described the integrated movement of the pelvis, legs, spine, shoulders in walking as a “composite spring” which provides propulsion so that the spine and pelvis can move on the leg bones – “..rock back and forth and sideways, allowing a rebound and recovery of balance between each step..” The Thinking Body p134. Thus, when I suggest that we “spring into a one-legged balance; perhaps some form of tree pose – you now know what I am thinking. Teachers inspired by Mabel’s thinking use imagery to help change muscle patterns. Key to this is an understanding of what the movement is. The nervous system (messenger of signals) , muscular (the motor) and skeletal (support) all have a specific role but for movement to occur all three systems must be involved. Alexander taught that any action involves the use of the whole self, The Use of The Self ,1932. In the 1980’s Serge Gracovetsky, Phd, (Dept of Electrical and Computing Engineering, University of Montreal), wrote about human locomotion in his Spinal Engine theory. He studied the transfer of energy in the spine and wrote that deep spinal movement is at the centre of walking and running, underlying the movement of our arms and legs. It had generally been perceived that the legs carried along a passive trunk – The Pedestrian Theory of Locomotion. Gracovetsky said that the limbs amplify movement that originates in the musculature of the spine and trunk. The arms in running, for example, amplify spinal movement to counterbalance leg movement and to assist in raising and lowering the body’s center of gravity to support the stride. With thanks to http://perfectgolfswingreview.net/spinalmotion.htm for the visual aid. If we can understand and visualize this movement, perhaps we can be more aware of a part of the movement where we habitually hold tension, thereby compensating for that “wonky” bit with another part of our musculature – Sensing our bodies to reduce movement compensation. I called this to mind when mention of some hamstring problems featured recently in class. I began to wonder if we fixate upon tight hamstrings we dilute the sense of the spiralling pelvis which will, I think, impact upon the fluidity of movement. Very tight hamstrings do restrict pelvic rotation and range of movement. 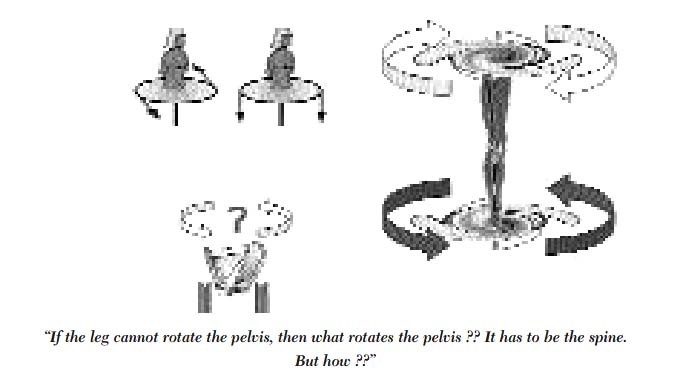 Thus, since there is a mechanical and a neurological aspect to muscle tightness, it may be more difficult, for some, to sense the subtlety of the spiralling pelvis (more on this in the next blog). This is also why simply stretching tight hamstrings is not always the best thing to do. The brain needs to learn which muscles should fire for efficient movement. Rather than static stretches, we explored movement through the pelvis, spine and leg as we used gravity to support us. More useful I felt – as is the beloved Sprinters in strengthening the hamstring of the front bent leg whilst lengthening the musculature of the back leg. We concentrate upon keeping a quiet foot, as we lift a relaxed spine. It can be tougher to explore the whole movement, slowly however, since mindful awareness of all three branches of the neuromuscular system means noticing when excess tension creeps in – namely, when we don’t feel ok. Let me know what you think. *END NOTE: You may be interested to know that the aforesaid student was not convinced by my learning and supplemented the teaching with a concrete visual aid. That is what I call effective teaching. See some of you next week. As I published the last blog Fear and fearlessness in yoga practice, Rick Hanson’s newsletter Feel Whole. Just One thing landed in my inbox . Hanson is an American psychologist who has written extensively on inner resilience. It always seems a little forced when I make links between our yoga practice and such erudite statements but – these posts and our practice is all about sharing. 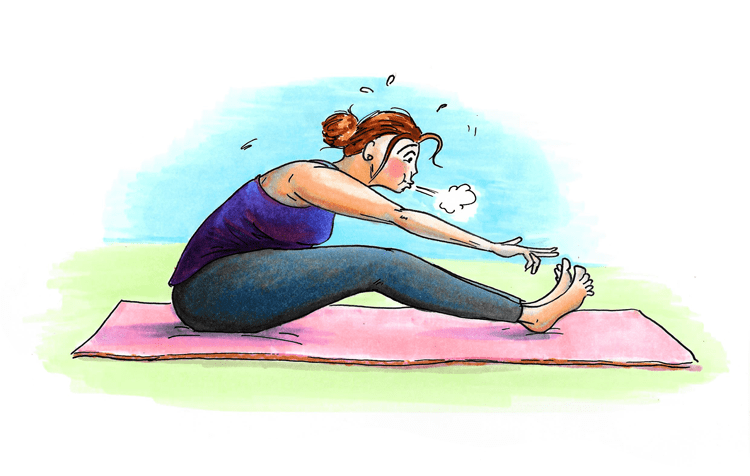 So – deep breath – when we practised soft forward bends → uttanasana →- squats this week, we did so with a sense of the whole movement emanating from well-placed footprints. We were aware of the work in the hamstrings and gluts but the emphasis was upon the movement and to what extent we were able to map this movement and sense this movement travelling through the body. All about the whole movement. This experiential learning necessitates a willingness to “listen to the body” and a little hint about being brave enough to pause, sometimes helps some of us. I am still excited about the fact that by pressing into one footprint, for example, the sensory messages that allow us to lift, drop, flex, extend, side bend and rotate can be felt so clearly – if we relax. 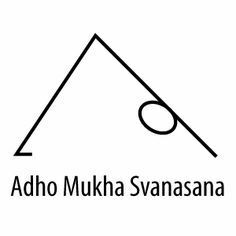 If you come to class, you will have practised the one-legged psoas release movement. Freeing our breathing helps immeasurably, of course, and we work on this at the beginning of every session. You may find something else in previous posts that resonates more clearly now or that you may wish to challenge. I am in the process of reflecting upon previous posts in order to test whether they stand up to scrutiny. By using the search box at the bottom of the homepage of insideyoga.blog you can submit a keyword and, hopefully, a post will pop up. There is much to explore on Rick Hanson’s site . You can subscribe to the free newsletter “Just One Thing” or download some of the guided meditations. Fear is a potent emotion which generally manifests as a response to an immediate danger. A sense of dread alerts us, through the amygdala that our physical selves may be harmed. The amygdala is part of the limbic system. It is responsible for the response and memory of emotions – especially fear. We tend to lump anxiety and fear together and they are certainly linked. However, anxiety is a general state of distress that is longer lasting than fear and is often a response to a non-specific “threat”. When we hold onto fear a sense of foreboding keeps the body on alert and the resulting tension depletes our emotional and physical reserves. Movement can help to reduce tension. Rocking is neurologically soothing. Our knowledge of ourselves is organized through neurological patterns. Bodily movement signals to the brain that there are decisions to make; opportunities to take; dangers to avoid, and pleasures to pursue. Movements in a yoga class which stiffen the body and which are held in order to create a shape, are mechanical and undermine the fluid nature of ourselves. In our yoga sessions we concentrate upon simple movements which create a “level playing field” for all participants. By that, I mean that students can make choices as to the range of movement that is helpful to them as individuals, precisely because the movements themselves are ones which maintain human function. It also means that these are movements that can be “taken home” and fitted into a busy schedule. Relaxing the diaphragm becomes a familiar pattern, pressing into the feet to free the pelvis is established as part of our walking pattern. We begin to believe that we can rely upon our bodies as tension is released. Some people find the invitation to explore movement on the yoga mat with an emphasis upon curiosity as too unstructured for their liking. This is understandable. Teaching within a framework of sensory movement does have guidelines (especially safety guidelines) but it requires some degree of fearlessness on the part of students since you may be exploring a movement in a slightly different way to the person beside you. You may have to be brave enough to stop. When I took part in a 5Rhythms dance session, I floundered due to the freedom on offer – to move in accordance with our bodies’ response to the music. initially, I was taken back to movement and music classes at school and the encouragement to be a tree ( although that does sound like a yoga class also???) in truth, I felt a bit silly. However, as I relaxed, became less self-conscious and more fearless, I tried to “let go” but I am not saying that it was easy. The practice of the 5Rhythms is said by Gabrielle Roth to move the body in order to still the mind. The five rhythms are Flowing, Staccato, Chaos, Lyrical and Stillness and when danced in sequence, are known as a “Wave.” A typical Wave takes about an hour to dance. On paper this was familiar territory for me – the first piece “flowing” promotes movement that celebrates our fluid body; the final piece is “stillness”. The Wikipedia entry describes the work “…taught through a series of maps that explore the terrain of the inner and outer worlds of individuals, their relationships to others and the space around them…” This notion of the space around us and our relationship to others was very interesting. The final sharing of experience was so useful, something which is difficult to programme into a weekly yoga class, unless the class is a small one I think. Parts versus the whole in yoga practice. We’ll be rocking and rolling next week. See some of you then.